This artist's concept depicts the stationary NASA Mars lander known by the acronym InSight at work studying the interior of Mars. 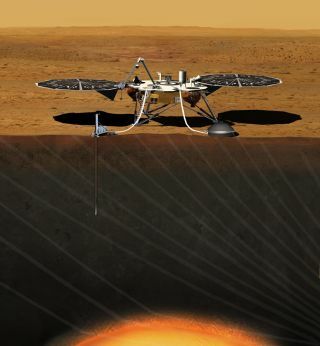 The InSight mission (for Interior Exploration using Seismic Investigations, Geodesy and Heat Transport) is scheduled to launch in March 2016 and land on Mars six months later. Image released Sept. 4, 2013. The next NASA robot to touch down on the surface of Mars will soon begin taking shape. NASA's InSight Mars lander, which is scheduled to launch toward the Red Planet in March 2016, passed a key design review Friday (May 16), clearing the way for construction of the spacecraft to begin. "We now move from doing the design and analysis to building and testing the hardware and software that will get us to Mars and collect the science that we need to achieve mission success," Hoffman added. Mission scientists will also use the communications link between InSight and NASA's Deep Space Network antennas to measure the tiny wobble in Mars' rotation. Such information could reveal whether the Red Planet has a solid core or a molten one like Earth's. The robot's two-year mission should shed light on how rocky planets such as Earth form and evolve, mission team members said. "Mars actually offers an advantage over Earth itself for understanding how habitable planetary surfaces can form," InSight principal investigator Bruce Banerdt, also of JPL, said in a statement. "Both planets underwent the same early processes. But Mars, being smaller, cooled faster and became less active while Earth kept churning. So Mars better preserves the evidence about the early stages of rocky planets' development." "We will incorporate many features from our Phoenix spacecraft into InSight, but the differences between the missions require some differences in the InSight spacecraft," said InSight program manager Stu Spath, of Lockheed Martin Space Systems Co. in Denver. "For example, the InSight mission duration is 630 days longer than Phoenix, which means the lander will have to endure a wider range of environmental conditions on the surface."